When reading radical historian Howard Zinn’s, A People’s History of the United States, it becomes clear early on that one can not talk about social movements without talking about the power structures that those movements fought against. Whether it was slave owning class, robber barons, war profiteers, White Supremacist power structures or other sectors of power, Zinn makes it clear that every major social movement experienced push back from these structures of power. 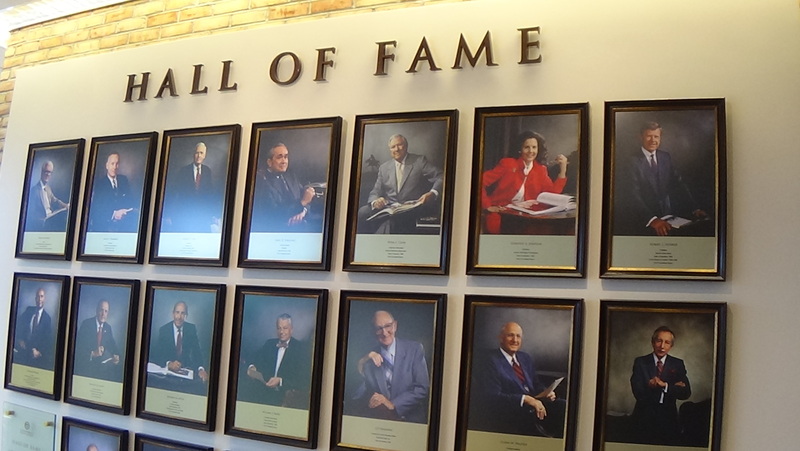 Some of the individuals of these power structures in Grand Rapids are enshrined on the walls of one local university. If one has ever attended an event at the GVSU downtown Grand Rapids Campus in the Eberhard Center, they would inevitably come across what the university calls the Hall of Fame. On two walls on the second floor of the Eberhard Center there are currently 56 framed photos of people whom Grand Valley State University gives special honor. Most of these 56 individuals have been or are currently part of the local power structure, in that they represent both members of the capitalist class that have either donated large sums of money to the university and often influenced campus policy. 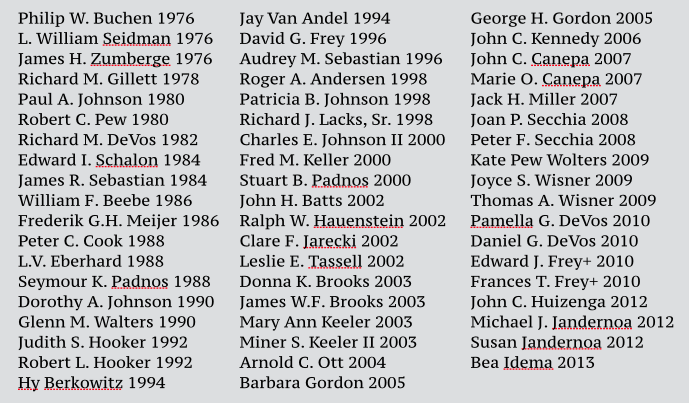 Here is a list of the 56 and the year they were inducted into the GVSU Hall of Fame. This statement by Murray underscores the power that donors have had on policy at GVSU. This reality is consistent with the kinds of political and economic influence those in the Hall of Fame have had and continue to have in Grand Rapids. Many of those on the Hall of Fame continue to be involved in organizations like Grand Action, The Right Place, the Grand Rapids Chamber of Commerce, the Acton Institute and the West Michigan Policy Forum. Many of those on the Hall of Fame have acquired wealth through the exploitation of others and have used their wealth to advocate for anti-worker policies, have funded anti-LGBT and anti-choice efforts, as has been documented elsewhere and should be seen as part of a larger local power analysis. For working class people, those who identify as LGBTQ, communities of color and feminists, this Hall of Fame would more aptly be named a Wall of Shame or even a Wall of the Despised, considering the collective harm that has been done by those enshrined on the walls at GVSU. This entry was posted in Anti-Capitalism/Labor and tagged defeating domestic partner benefits at GVSU, Grand Rapids Power Structure, GVSU Hall of Fame, how funders influence GVSU policy. Bookmark the permalink.